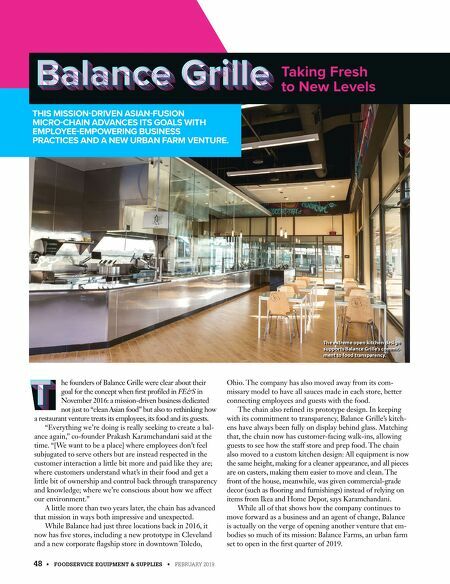 48 • FOODSERVICE EQUIPMENT & SUPPLIES • FEBRUARY 2019 he founders of Balance Grille were clear about their goal for the concept when first profiled in FE&S in November 2016: a mission-driven business dedicated not just to "clean Asian food" but also to rethinking how a restaurant venture treats its employees, its food and its guests. "Everything we're doing is really seeking to create a bal- ance again," co-founder Prakash Karamchandani said at the time. "[We want to be a place] where employees don't feel subjugated to serve others but are instead respected in the customer interaction a little bit more and paid like they are; where customers understand what's in their food and get a little bit of ownership and control back through transparency and knowledge; where we're conscious about how we affect our environment." A little more than two years later, the chain has advanced that mission in ways both impressive and unexpected. While Balance had just three locations back in 2016, it now has five stores, including a new prototype in Cleveland and a new corporate flagship store in downtown Toledo, Ohio. The company has also moved away from its com- missary model to have all sauces made in each store, better connecting employees and guests with the food. The chain also refined its prototype design. In keeping with its commitment to transparency, Balance Grille's kitch- ens have always been fully on display behind glass. Matching that, the chain now has customer-facing walk-ins, allowing guests to see how the staff store and prep food. The chain also moved to a custom kitchen design: All equipment is now the same height, making for a cleaner appearance, and all pieces are on casters, making them easier to move and clean. The front of the house, meanwhile, was given commercial-grade decor (such as flooring and furnishings) instead of relying on items from Ikea and Home Depot, says Karamchandani. While all of that shows how the company continues to move forward as a business and an agent of change, Balance is actually on the verge of opening another venture that em- bodies so much of its mission: Balance Farms, an urban farm set to open in the first quarter of 2019. Taking Fresh to New Levels THIS MISSION-DRIVEN ASIAN-FUSION MICRO-CHAIN ADVANCES ITS GOALS WITH EMPLOYEE-EMPOWERING BUSINESS PRACTICES AND A NEW URBAN FARM VENTURE. 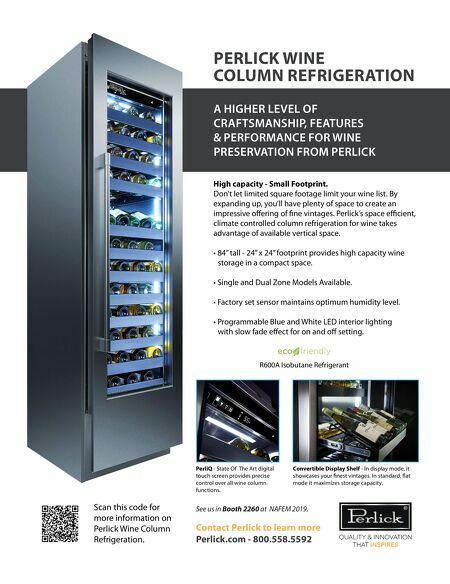 The extreme open kitchen design supports Balance Grille's commit- ment to food transparency.